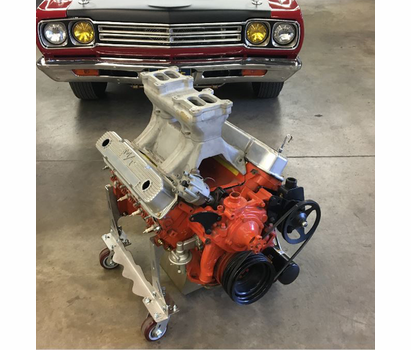 If you have an empty block, long block or a complete motor, the Mancini Racing Engine Dolly is the best tool to store and roll it around your shop or garage. 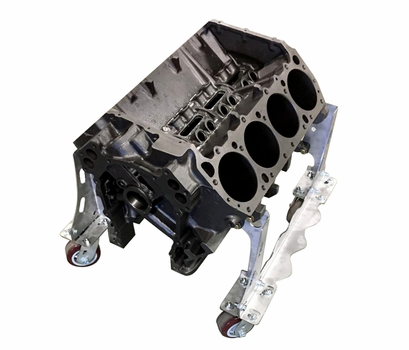 Based on the original design by AR Engineering (design used with permission) and made of 304 grade stainless steel, the Mancini Racing Engine Dolly will withstand years of use, will never rust and is not affected by gasoline, oil, water or fluids. 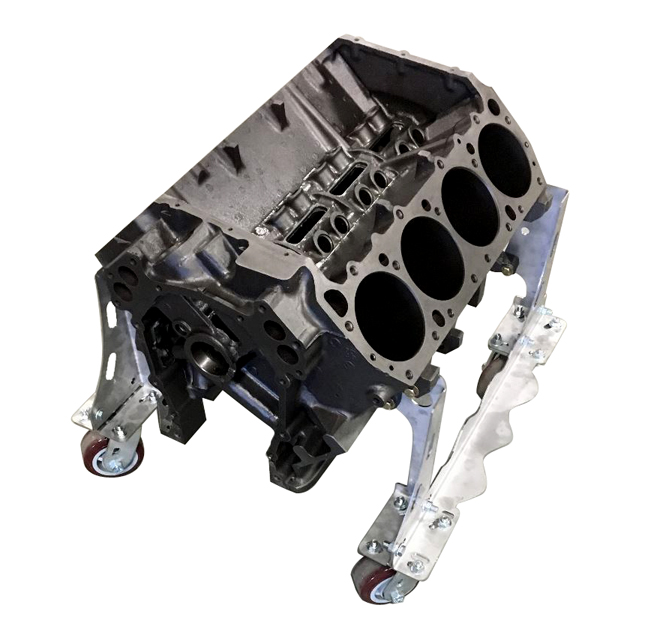 Bolts easily onto the engine mounting ears in the front and the bellhousing location in the rear - all hardware is included to mount the Engine Dolly to your Mopar Big Block; fits 361, 383, 400, 413, 426(wedge) and 440 motors with standard OEM tab type engine mounts on the block. (some specialty motors, such as 67-69 A Body big blocks require an adapter - contact us for details). Has plenty of room for deep oil pans with over 9" clearance below the block oil pan rail. Have a road race oil pan with kick outs? Plenty of width for those wide pans or race oil pumps and pickups as well. 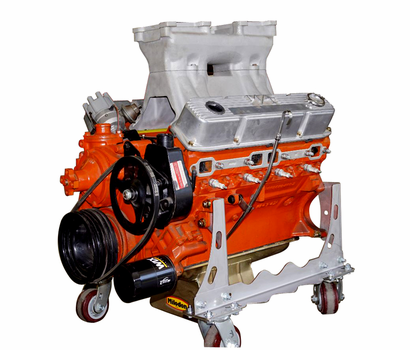 Need to secure the engine while on the dolly in the back of your pickup truck? Convenient slots for cargo straps on each upright make secure tiedown easy. 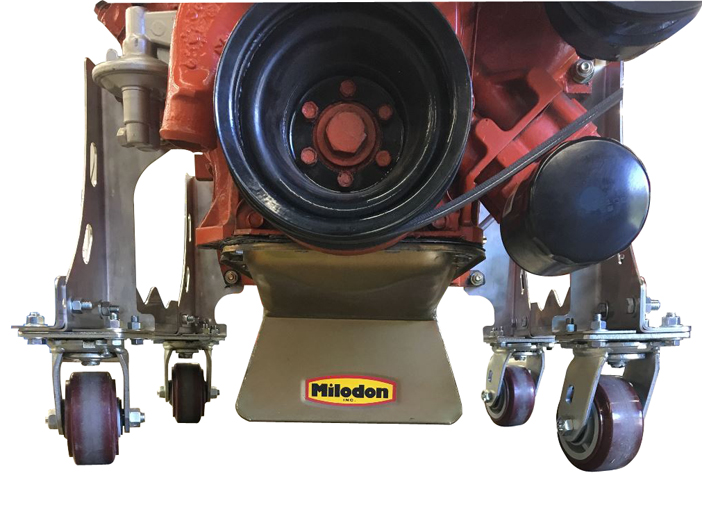 For any Engine Dolly, it is all about the Casters. We source these casters from the same company that makes them for our K-frame stands and Rotisseries. These 4" caster wheels are rated to support over 500lbs each. 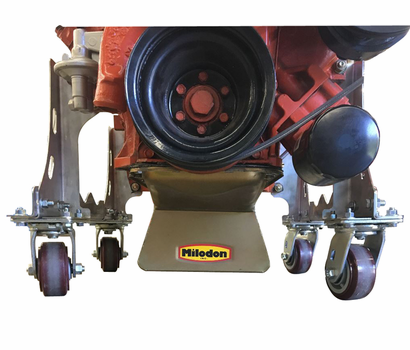 We put four of them on the Engine Dolly because we have a simple philosophy that is the foundation of our products; "Nothing overbuilt ever broke". We start by CNC laser cutting 304 Stainless steel sheet, then fold these on our CNC Press Brake, add four(4) high strength ball bearing swivel casters and all the hardware to mount these to your block or engine. 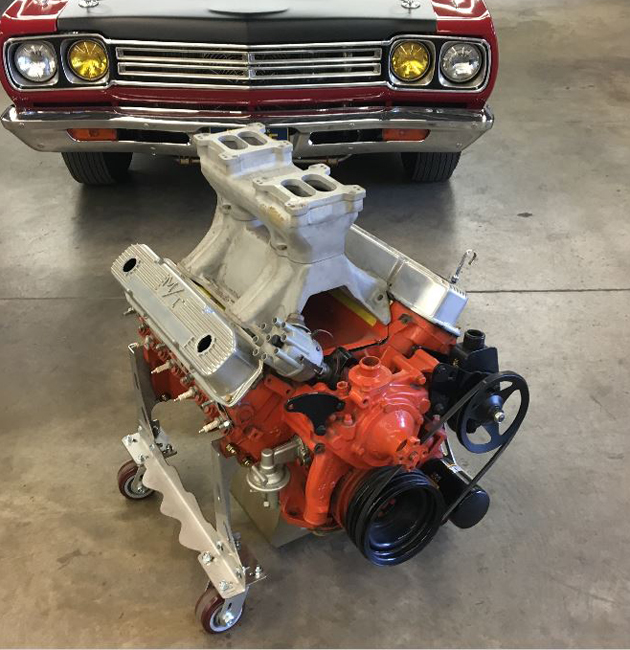 Everything you need to easily store and move your Mopar Big Block is in the box - except a motor to block this to and a few wrenches to tighten the bolts.